Chard is a hearty stalk that makes its way onto our plates in early summer, and we dig its flavor and nutrient profile. 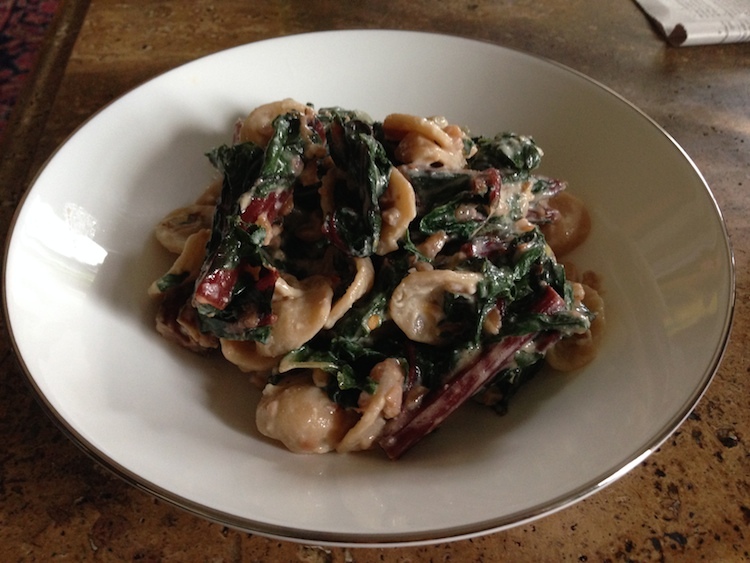 Paired with whole wheat orecchiette pasta and creamy ricotta, the dish pleases everyone. Just make sure that you make a ton of it to save for leftovers! In a small bowl, mix together, the ricotta and parmesan cheeses, the lemon rind. Add salt and pepper to taste. In a skillet over high heat, drizzle olive oil and saute onions and garlic. Add chard, lower to medium heat, and mix well for about 1-2 minutes. Reduce heat to low, cover and allow chard to steam cook (about 3-5 minutes). Prepare pasta as directed. Drain and fold cheese mixture into pasta, Add veggies and serve.